Since August 2014, Wärtsilä has been engaged in initial ship design for the project Midway Alignment of the Bothnian Corridor. The concept, outcome of the the first phase of the ship design process, the so-called Initial Design, has now been published. It covers the main features of the future vessel as well as the space allocation for all the functions that the ferry will be equipped with. Starting from this concept, the work will now focus on ship design in more detail, in a phase called Basic Design. The following phase will cover the competitive bidding for ship-building, and the final design will be carried out together with the shipyard which submits the winning tender. 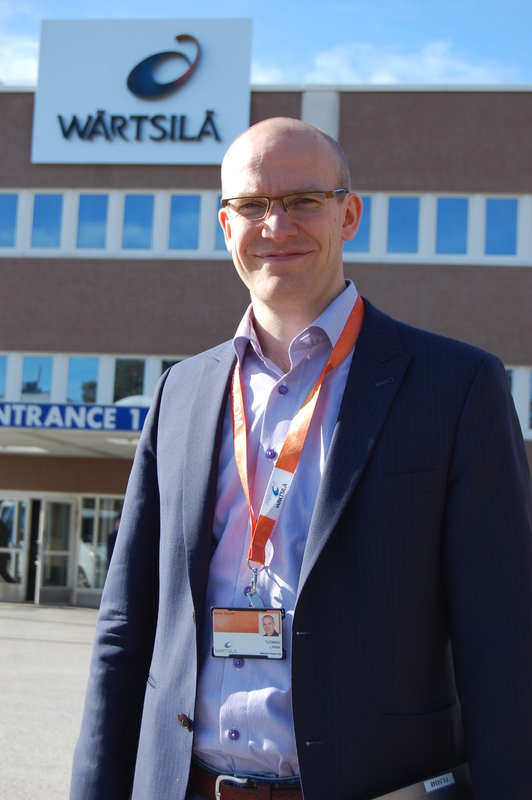 Mr. Tuomas Linna, project manager at Wärtsilä, leads the design team of the ferry intended for traffic across the Kvarken Strait. The design team cooperates closely with the client team that Midway Alignment has convened to advance the daily design work. This group includes representatives from Wasaline Shipping Company as well as experts from the maritime design companies Foreship and SSPA. Mr. Torvald Hvistendahl, Naval Architect at SSPA, coordinates the daily activities in the client team. According to Mr. Linna, the starting point for ship design is a vessel, a unit, that functions independently, without the support of any surrounding infrastructure. – The ship design process is iterative and deals with the expectations set for the ship and the possibilities to meet these expectations, over and over again, so that the process evolves like a spiral from the outer track inwards to the kernel until the final concept is complete. Ship design is team work and includes a lot of optimization and many compromises, Mr. Linna says. Mr. Tuomas Linna, project manager at Wärtsilä. The design of the vessel for the Kvarken route is, in many ways, more demanding than that of an average ship, because the Kvarken ship will be the only one in regular traffic between Vaasa in Finland and Umeå in Sweden and it will have to serve as a passenger ship, ferry and cargo ship, all in one. It must serve tourists, truck drivers, conference participants, families and children as well as people who are travelling in business. The ship will have a car deck along the entire length of the vessel, an open afterdeck and space for large goods as well as sun deck, restaurants, conference rooms and cabins for passengers. – The ship that we are now designing is very special and, consequently, the design process is also demanding, Mr. Hvistendahl admits. We have been working together towards finding the best possible solutions. The cooperation in the design process and in Midway Alignment in general, has been good. During the course of this work, the designers have been compelled to give up some requirements regarding the ship but the most important features are intact in the concept that is now been published. The ship must be reliable, energy-efficient and environmentally friendly. The ship will have the best possible ice class, 1A Super, and it will be streamlined to minimize friction. It will have gas as its main fuel but the engines can run also with other fuels. The ship will be a hybrid, meaning that it can utilize retained electrical power for drive and hotel services. The batteries can be recharged with solar energy or through the mains in ports or the engines when they are running. When the ship is berthed for overnight stay in the port, it can be attached to the district heating system. 04.05.2015 Prepared for a successful exhibition!